Peak Roofing Contractors takes pride in being part of the National Roofing Contractors Association or NRCA. The NRCA is an association of roofing experts from the United States and other countries worldwide. Established in 1886, they strive to improve the roofing industry and provide unparalleled customer satisfaction. What Does It Mean to be NRCA-Certified? NRCA-certified roofing contractors in Northern Virginia, such as us, get support from the association to grow our business. At the same time, we are protected from proposals that can adversely affect our company. We also have free electronic access to all NRCA publications, which can help keep us up-to-date with the latest roofing technology. In addition, we go through extensive training that will help us do our job better. Lastly, we carry the NRCA logo – this means that we are identified as the industry’s premier professionals. 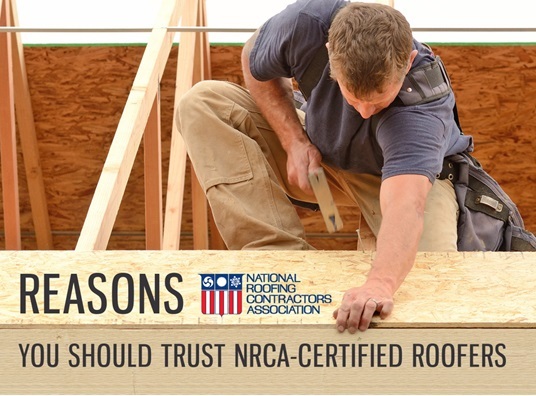 Why Should You Work with NRCA-Certified Contractors for Your Roofing Needs? As one of the few roofing contractors in Manassas, VA, that are NRCA-certified, we have access to the latest roofing technology. This allows us to provide you with better service. This will help us answer tough roofing questions, so can you make an informed decision when it comes to your roofing needs. You can also be sure that our installation methods are seamless and up-to-date, ensuring optimal performance of your roof. You can also expect us to be courteous and professional throughout the project. Aside from being NRCA-certified roofers in Northern VA, we also have certifications with other industry leaders, such as GAF and CertainTeed. This lets us provide you with high-quality roof that will meet your roofing needs. We offer roofing shingles that can withstand strong winds and severe weather conditions. You can also choose from a wide range of styles and colors that will enhance your home’s curb appeal. Finally, they come with manufacturer warranties for your peace of mind. You do not have to think twice when it comes to working with Peak Roofing Contractors. Call us today at (703) 745-5153 for a FREE estimate.